The Solar Module SunWare TX 14152 17Wp Winter Battery Charger are stitched into an extremely robust textile frame with foldable wings. The soft divider between the rigid module and the textile frame allows the modules to be fastened to taut textile surfaces such as a tarpaulin. Each wing of a multi-wing module works independently, which reduces power loss if partially shaded. A watertight plug connector is fitted to the short module connection-cable for easy removal of the module when the tarpaulin or similar is folded away. The module is fastened to the textile top using Tenax fasteners. Matching Tenax base parts for textile surfaces are enclosed with each module. Other fastening methods such as hook and loop tape or zip fastener may be sewn onto the frame. 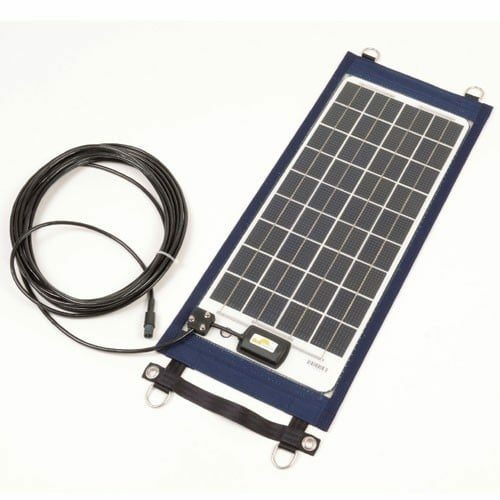 The Solar Module SunWare TX 14152 17Wp Winter Battery Charger is the ideal battery charger when boat is not in use for long-term and the batteries must be maintained .e.g. for winter storage. The SunWare Solartechnik GmbH & Co. KG, based in Duisburg founded in 1987 by Dipl.-Ing. Julian Schüren. Initially specialized in the production of solar modules, solar charge controllers for marine and caravan applications. The solar modules are specially designed and developed for use in the maritime sector. The modules are available in 12 volt and 24 volt versions. All used components of the entire module are absolutely see-and saltwater-resistant. Join our ZERO Home Bills Community. The Best Semi Flexible Solar Panels from the BEST Solar Brands at the BEST Retail Prices available in your market on ZEROhomebills.com by Solaranna. The SunWare Solar GmbH & Co. KG has been producing and developing more than 20 years maritime solar systems. This long-standing expertise in maritime solar technology, with its own development and production department with a team of young, motivated staff, SunWare has become the market leader in a market segment for demanding solar product solutions. SunWare holds various German and European patents that relate to production and manufacturing technology. The SunWare solar modules are specially designed and developed for use in the maritime sector. The modules are available in 12 volt and 24 volt versions. All used components of the entire module are absolutely see-and saltwater-resistant. Join our ZERO Home Bills Community. BEST Products from the BEST Brands at the BEST Retail Prices available in your market on ZEROhomebills.com by Solaranna.